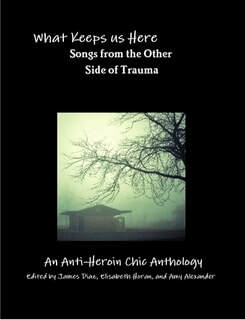 description: This anthology features authors from Anti-Heroin Chic Magazine focusing on trauma and healing. description: 'Anti-Heroin Chic' meaning that what is beautiful is what is broken, that our imperfections, our exiles, our exclusions, are what define our humanity most, not the polished surface or the Instagram culture which encourages us to dissociate from who and how we truly are. There is a seat for everyone here at this table. The idea of the commune very much animates this project. This journal strives for inclusion and a diversity of voices, not to disparage others but to lift them up. It also strives to publish those who are being neglected or under-served in the literary community. description: an independent publishing house & literary journal dedicated to the celebration of music in all its forms. description: We are a very bad pony. Maybe we have always been that way. Maybe we had a particularly bad childhood where instead of hay or grass, we were fed a large amount of Starburst. Or that we drooled while parents were taking pictures at the petting zoo. Maybe it is the fact that we often steal carrots from pockets or give children a little nip if they petted us too much. But we digress. description: Moonchild Magazine is an experiential online journal that publishes dreamy visual art, poetry, translations of poetry, flash fiction, mixtapes, collaborations between writers and artists, and more. description: BE ABOUT IT started as a literary/art zine in 2010. After four great years of zine publishing, they also now make ebooks and chapbooks, and host a reading series based out of the East Bay. description: witch craft magazine is defiantly unapologetic of its place in the world. they share work that amplifies what it feels like to break apart from a society constantly trying to define us, or find a safe space within it.